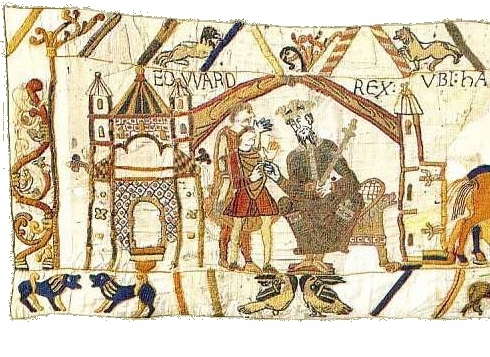 I wrote a post in April about English Great Halls, and this week I’ve decided to consider the larger question of English royal palaces in the early medieval period, prior to 1066. It is much more difficult than you might think. When you see or hear the word “palace” probably something like this immediately pops into your mind. But this little charmer was built by Ludwig of Bavaria in the 19th century, so forget it. We’re not going there today. We’re considering English royal palaces of the 11th century. Not castles, mind you, which were built for defense, but palaces that were intended specifically as royal residences. They looked more like….well, you know, we really don’t know what they looked like. All we can do is guess. Ah. Speculation upon hypothesis. Well, let’s run with it because what other choice do we have? What we see in the Aachen drawing is not one building, but a complex of buildings, connected by covered walkways. This makes a great deal of sense to me, and I especially like the idea of those covered walkways, given the British climate. The Great Hall was merely the central building, though. In the Old English poem Beowulf King Hrothgar retires from the great hall to go to his bed. 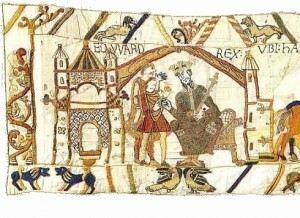 Beowulf himself, a visitor to the palace, was lodged somewhere outside the hall. One imagines separate quarters where guests could sleep, connected to the hall, perhaps, by those covered pathways. And speaking of bedchambers, the royals would have used them for more than just sleeping. The chamber would have been far more complex than today’s bedrooms and more highly populated. The queen’s bedchamber, for example, would have been a place of refuge for the women if things got too rowdy in the hall.3 It’s my belief that the queen might very likely have had her own building in the complex divided into rooms earmarked for different purposes. 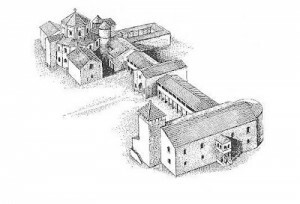 There would have been other buildings in the magnificent, urban palace complexes of London, Canterbury and Winchester: kitchens, stables, and a chapel, certainly; possibly weaving sheds, a forge, and an armory as well. At Winchester there was a mill. The rural palaces, like those at Headington, Cookham and Calne, would have had all these things and would have been the focal points of large estates that included entire villages. There were hunting lodges too, where the king and his retinue could enjoy a little recreation and where, apparently, regulations regarding arms were somewhat relaxed. 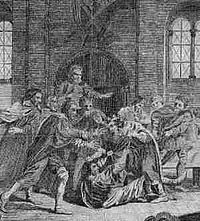 King Edmund the Elder was killed in an altercation with a robber at his hunting lodge at Pucklechurch in 946. 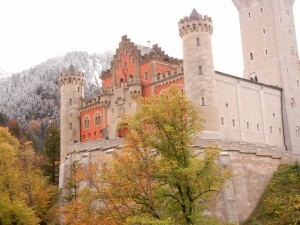 One vexing question that remains is whether the palaces were made of wood or of stone. We can’t say for certain, but it’s likely that both stone and timber were utilized. The hunting lodge at Corfe appears to have been made of stone, and if stone was used for a hunting lodge, surely it would have been appropriate for the more magnificent, urban palaces. on this bright capital of a broad kingdom. 1 Welch, Martin, Discovering Anglo-Saxon England, Pennsylvania University Press, 1993. 2 Burke, John, Life in the Castle in Medieval England, Barnes Noble, 1992. 3 Webb, Diana, Privacy and Solitude: The Medieval Discovery of Personal Space, Hambledon Continuum, 2007. 4 Lewis, Michael J., The Real World of the Bayeux Tapestry, The History Press, 2008. Fascinating! Thank you for the informative post; I wish we knew more but perhaps someday we will! Such an interesting time period (that you bring alive so well!). Morgan thank you for your comment. (I love it when people comment; it’s a thrill.) I’m glad you found it informative. It’s such an interesting topic, and the dearth of information is, I can tell you, maddening for a histfic writer! Thank you Demien. This is a post I read over and over again as I set scenes in the palaces of Winchester and London, imagining what they might have looked like. Very interesting! I love the history surrounding buildings and how they evolved or disappeared over time. I’ve always been fascinated with that concept of Castle and how it has taken on such a different meaning or representation now. We hear the word Castle and immediately think one of two visions- the Fairytale image or the cold bleak stone walled image. In reality, as you’ve pointed out, it was most often something in between those two visions. I do like your theory on the wood and stone combination, and how they most likely resembled those residences or strongholds of the Carolingian dynasty such as at Aachen. I do wonder about those earliest palace complexes such as in Alfred’s time and before that. My personal thought is that while the early Anglo-Saxons may not have had the skills or manpower necessary to maintain or replicate the Roman buildings left throughout England, they may still have appreciated some the vision left in the ruins and remains of the layouts. As the Roman buildings decayed and fell into such disrepair as to not make them inhabitable any longer, my thought is that the next generation of builders may have salvaged what they could, adapted some of the foundations and layouts of complexes as they attempted to create their own versions based on what skill and manpower was left available to them. Thus the complexes retained some of the original foundation or layout such as with the central courtyard area and great hall or reception/meeting place with the covered walkways to outbuildings. What I find most fascinating is how the earliest portions of buildings evolved and became part of later additions to the buildings! Hi Judy. Yes, I think you must be right about the early Anglo-Saxons appreciating the vision left in the Roman ruins. It comes through in their poetry, doesn’t it? And that was a world in which very little was wasted, I think, so it makes sense that they would have re-used materials right down to the foundations.